English translation of the interview for a Polish website. How does it feel to be an AFOL in Poland? Are you treated like a weirdo or an eternal kid when you speak of your hobby? I’m not, surprisingly. Sometimes it feels like I find this hobby funnier than people who are strangers to it. You know, I make stuff like a walking spaceship, I like to joke that my apartment looks like a 10-year-old’s room. At the same time people who are closer to being normal than I am are genuinely impressed by the engineering side of this whole enterprise. Is passion for LEGO something you grew up with, or something you developed in your adulthood? What followed was pretty typical for an AFOL: during my adolescence I felt too grown-up to play with some childish bricks and my LEGO stuff ended up in the attic. It was only as I was graduating that I remembered all these pieces were still up there. Then I discovered that many sets I could only dream about as a kid were now available at the second-hand market, and that’s how it started. How complex can “LEGO engineering” be? Is it subject to the real-life principles? I believe that the level of possible complexity is still being increased – both by us, the fans, and by the LEGO company itself. I’ve built a truck model with 17 motors and nearly 19 meters of wires. On the other hand, LEGO is releasing a 42055 Technic set this year, with nearly 4,000 pieces. Sets like this were beyond our wildest dreams back when I was a kid. 15 years ago a Technic set with 1,500 pieces was considered a top-of-the-line marvel. I’ve seen complex clocks built with LEGO, or automated looms and braiding machines, or combination locks. I suppose the final limitation is still the builder’s imagination. The real-life principles apply at all times, of course, as you can see for instance when building off-road cars. They are built in a way quite similar to the real cars, and they are subject to the same limitations. I have just started to build a Land Rover Defender model and I need to equip it with differential locks to achieve a decent off-road performance, just like with the real car. I have also used portal hubs to prevent huge wheels from damaging the axles – any person who’s into off-road stuff knows what I’m talking about. The medium is a limitation, too. We’re building with plastic pieces pushed into one another, and we drive them with motors which were designed for kids’ safety, not for performance. There are no screws, no gluing things together. That’s why the performance of even most brilliantly designed LEGO models falls behind what the real RC vehicles can do. That’s impressive! Which build makes you proudest? I was also happy when last year I have finally completed model of a motorbike from the Akira anime. It was so small that I could only fit motors inside, it ran on external power, but it was really detailed and included the distinctive stickers. I have also built a fully remote-controlled model of the batmobile from Batman Begins movie. Some people call it better than the official LEGO 76023 Tumbler set, which is really beautiful and detailed but doesn’t even have a steering. In general, though, I suppose I see more flaws in my models than the audience usually does, so my focus lies on what’s currently happening at my workshop, not on what’s been already built. I know I will probably never make a model that is perfect to me, but I enjoy trying. That’s what hobby is supposed to be about, I think. When did you decide that it wasn’t enough to build for yourself and you launched a YouTube channel? It’s not like that, I’ve initially started a YouTube account just to make playlists of favorite songs, probably like most people. There never was any plan to “launch” anything, nor a single decision to “try to become a star” or something like that. I remember that my first YouTube video was maybe over 10 seconds long footage filmed by handheld cellphone and it was made and uploaded on request. I have written about a model I’ve made back then, that it developed certain speed, and someone had a hard time believing it and asked for a video. That’s how it started, that’s what my first videos were like. They were examples and proofs that e.g. my LEGO crane can lift that much weight or that my truck can pull 10 kilograms of load. I can’t really say when it became something more serious. I simply became gradually interested in editing videos and I’ve been experimenting with it more and more, trying to make the sort of videos I would like to watch. There was no greater ambition to it. I recall that it was the audience who prompted me to start recording in quality above 360p, to invest in some decent video equipment. Today I have certain habits, routines and ways of filming, I think I have some idea of what my audience likes. But all of this results from a long, natural process and not from a plan of some kind. Last November I’ve joined a Polish MCN called Epic Makers. I’ve been with an US MCN before and I’ve decided to change it because I wanted to become more recognizable in Poland. I got tired of being watched by Poles who had no idea I was a Pole, too. If I’m correct, you are recording exclusively in English. Your audience is mostly foreign. Are there many Polish viewers? Yes, ever since there was some text in my videos, I’ve made a choice that it should be accessible to anyone, from anywhere. It was related to this specific hobby, I think – the LEGO fans community is international and I simply didn’t want my models to be described in a way only accessible to Polish fans. I have been watched mostly by US viewers for years now, and also German, French and recently more and more Russian ones. Poland has always been in my top 10. There are occasional traffic peaks when some model of mine is shown in local media, but on average Poles constitute up to 5-6% of my total audience. I often hear that I should record in Polish, but that seems difficult to pull off. I mean, that would require two versions of each video or two versions of subtitles and ability to switch from one to the other, and all of this for Polish audience who has generally good understanding of English. We’re talking about plenty of extra work and making everything much more complex for one or two percent of the viewers, really. Besides, if someone gets motivated to learn English by my videos, I believe he will only benefit from it. Poles use a language that has 22 forms of the word “two” on a daily basis, so how hard can English be to us? 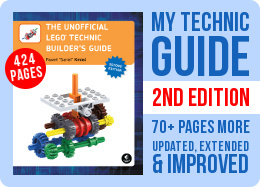 Your activity extends beyond YouTube, you have also written a book on building with LEGO pieces which was translated to a number of languages. What are your relations with the LEGO company? Are you a permanent contributor? Last year LEGO has also recognized a thing called online LUG, that is a group of people who are not formally associated, but rather brought together by a single medium like a blog or a YouTube channel. Such an entity works in a little different way, and my channel is now recognized as one. There are certain benefits to it, like sets for reviews, but it’s LEGO marketing team who decides which sets and when. We also have obligations, like participating in topics LEGO wishes to discuss or working with work groups that examine various subjects, for example the impact of 3D printing technology on LEGO world. 3D printing technology! Do you think it’s a threat or a chance for the LEGO? It’s more of a chance. LEGO is using 3D printing extensively when designing prototypes of new pieces, and on the other hand the prices of 3D printing and difficulty in creating parts that match LEGO pieces well are too high for someone to just start mass-printing their own custom pieces. I know that because I work with a few designers, we come up with some ideas for new pieces, they design these and I print them via the Shapeways website. It takes a fortune to print something large, and the resulting pieces are coarse, kind of fragile and they wear down quickly. For instance, one of my models was fitted with special 3D-printed drifting wheels, but judging from the wear, they probably wouldn’t last 20 hours of use. There really are no formal requirements except for two: LEGO asks for a disclaimer that makes it clear that this set was given for review, but reviewer gives his own personal opinion. This is meant to prevent being accused of whisper marketing. The other requirement is sending back a report on views and comments every video gets in a day, a week and a month. I know that LEGO marketing team looks into this data, and I know that LEGO is using these video reviews internally – they keep copies of videos in their archive and they screen them internally, I guess as examples of the feedback the specific set generates. Personally, I’ve had some of my videos seen by the designer of the given set who then thanked me for the review. We get a release date, of course, which determines when we’re allowed to publish the reviews because we get the sets before they hit the market – usually around 2 months earlier. It’s fun on one hand, because you’re getting free stuff early. On the other hand it sometimes means you need to build 10 sets in 3 weeks, not to mention how much time it takes to complete a review the way I make it. I estimate I spend around 12 hours filming and editing a review of a medium-sized set, plus the building time which can amount to up to 7 hours with the biggest sets. There are, of course, reviewers who simply sit in front of the camera with a box and say what they like about the set and there is nothing wrong with that. My goal is simply different – I’m trying not to be the middle-man, but to leave the viewer “alone” with the set, experiencing it directly. Over years of reviewing I have developed a certain pattern that I’m still trying to perfect. I’m thinking of who watches my reviews and what for, and I’m trying to include information that will be useful to that person – that’s why, for instance, I’m paying attention to how safe and playable for little kids a given set is, because many viewers are the parents looking for a toy. Recently I’ve started evaluating authenticity of the LEGO Technic sets, because authenticity became one of the core values of design for these sets and the LEGO company is actually advertising their sets as authentic. The licensed sets, such as the 42043 sets, are great examples of this. There’s also a Porsche-licensed set coming out this year, the 42056. So if they’re making it a selling point, why not evaluate it? In general, I have a few categories that together affect the final note a reviewed set gets, from its looks to how good “pieces donor” it is. Sometimes an average-looking set is overflowing with rare or new pieces. I’m also evaluating playability of each set, trying to look at it through kid’s eyes, as well as the building experience it provides – there are sets that can teach you very interesting building techniques. All in all, I think it’s a lot of work and a serious responsibility. There are times when I strongly dislike a set and I’m worried if I’m being fair with it. I’ve noticed that people make a fuss over me getting free sets. I’m being asked again and again about how to get stuff for free. Let’s be honest – I’m not getting free sets for asking nicely but because I’ve spent years developing my YouTube channel. And besides, yes, I’m getting sets worth a few hundred euro for free every year, and yes, it’s nice, but at the same time the real YouTube stars out there are getting paid hard cash for just speaking nicely about some product. Is there some dreamed-of license or a vehicle you’d like to see in a LEGO set? There’s plenty of vehicles we’ll never get to see in LEGO sets because they are military. My dream would be a huge, detailed P-51 Mustang model but the company policy will never let it happen. It would be different if it was a Star Wars fighter – there are no limitations here and many people see some hypocrisy in how LEGO refuses to make e.g. tanks, but a Death Star, designed specifically to blow up entire planets, apparently makes a great toy for children and is available in many versions. There have also been models of the classic biplanes made more than once, like the 10226 set just four years ago, and let’s be honest, it’s a fighter plane made to shoot people down, not to enjoy the views. On the other hand, I’m curious about that Porsche license whose beginnings we’ll see this year. I hope it won’t end up with a single set. We’ve had Ferrari-licensed Technic sets before and they were not only great sets, but also a powerful inspiration. I guess you still buy sets just for you every now and then. When buying a set, do you think about building it as the designer intended or are you just looking at parts and thinking of how to use them? To be honest, in the recent years I have been buying sets either for review or for pieces. There are times when I need some rare piece that comes in one or two sets, and if it’s some small, cheap set, it’s simpler to just grab it from a shelf in a store than to order this one specific piece. But yes, every now and then I come across a set I just want to play with. That’s how I bought e.g. the 10242 Mini Cooper set, I’m very fond of it and I’m modding it on regular basis. I’ve made a tracked vehicle out of it already, a walker with legs and a boat. Now I’m reworking it into a snowmobile. Is this your only occupation? In other words, do you make a living by playing with LEGO pieces? Yes and now. I’ve been working as a graphic designer for almost 10 years now, mostly for media companies, and that’s how I used to make a living. But a year ago I’ve escaped the corporate world and I’m living partially off commissions and partially off royalties from the books. The YouTube income is a small part of it, but I can’t complain because thanks to the mostly foreign audience I’m making more money than a channel of similar size but only watched by Poles makes. The sad reality of today’s YouTube is that US audience pays the most and the rest of the world is only worth a pocket change. My plans include a number of large models that my audience has been patiently awaiting for a while now. These include a model of the famous Polish WW2 submarine, ORP Orzeł. It won’t float, unfortunately, but it will be large, with motorized parts, and I’m hoping it will get some people interested in its tragic history. I would also like to celebrate the end of Land Rover Defender production this year with a model. Perhaps by working with other YouTube creators I will get a chance to compare my model against the real thing. And somewhere along the line I will probably get my YouTube silver button. If everything works fine, perhaps I will celebrate it by visiting Denmark. Thumbs up from me! What more can I wish to an AFOL? More storage space? Wish for my books to be turned into movies, of course. I can see Tomek Karolak (a Polish actor) playing the 2×4 brick. I came across your blog quite by chance and I was hugely impressed. Top class. Keep up the good job. Eventually someone with perfect English and outstanding Lego building skills is being recognized beyond Poland’s borders. Well done, man. It’s all over the web, just use Google. 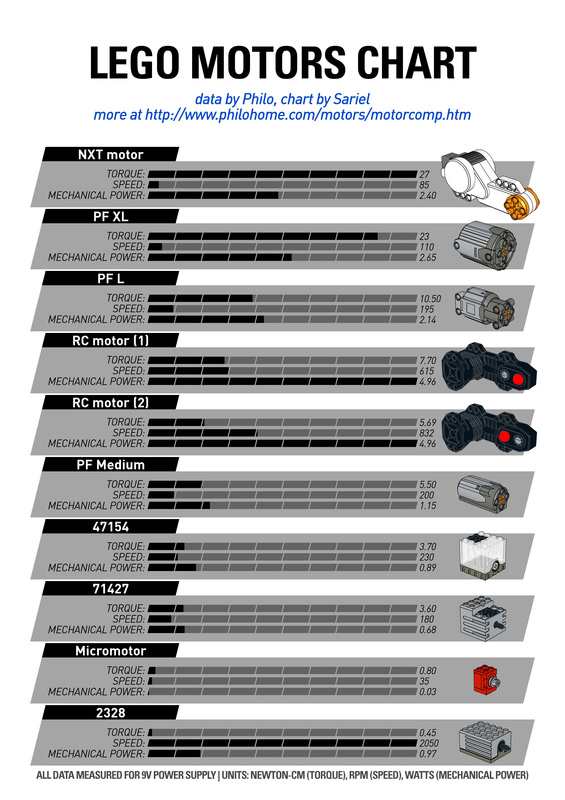 How do you know this stuff about the 2h 2016 LEGO Technic? Thanks, my first Technic set ever was the 8815. Thanks for the interview. Yes, you’re doing it right! I like your videos especially thanks to the “hands on” approach you take. Do you remember your very first Technic set? I remember mine being the set no. 8030 that I got for my 6th birthday, which – especially being a set with 140 parts – was an amazing set considering the variety of (5!) suggested models. Jestem pod wrazeniem. Naprawde. Pare miesiecy temu ogladalem Twoje video o Tiger. Bajer. Dzisiaj skladalem Lego z moim synkiem, 7, ktory bardzo to lubi i pokazalem mu Twoje video. 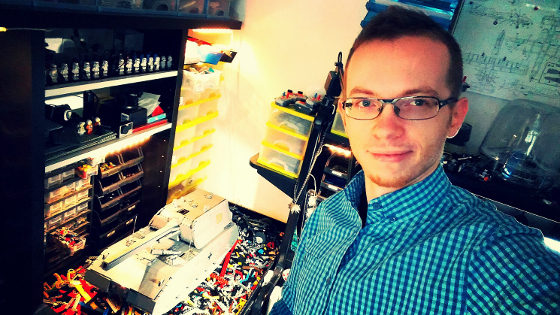 Chcialbym za rok zaczac z nim budowac Lego Technic i po przeczytaniu Twojego interview widze, ze to bedzie dobry start. Lego to jest super sprawa i masz racje mowiac, ze buduje wyobraznie. Moj syn ma 3-D wyobraznie i skladanie Lego sprawia mu duzo przyjemnosci. Nie jestem na takim poziomie co Ty ale jak moj syn moze byc. Niestety zaczalem swoja zabawe z LEGO jak sie urodzil a za komuny to mozna bylo tylko sobie o takich sprawach pomarzyc. Thanks for posting the translation! – Have people started sending you packs of cheese for your co-stars? Great you are indeed lucky it will be cool if you visit Denmark do send us some pics if you visit.My hamster just lassed away yesterday.